President Donald Trump on Thursday blamed Congress for America's "very dangerous" relationship with Russia, adding that bilateral ties between the nations are at an "all-time low." "Our relationship with Russia is at an all-time & very dangerous low. You can thank Congress, the same people that can't even give us HCare," Trump wrote on Twitter, taking an additional shot at the legislature for failing to pass an Obamacare repeal bill. Trump's comments on Twitter came one day after he begrudgingly signed a bill into law that placed new sanctions on Russia, Iran, and North Korea. 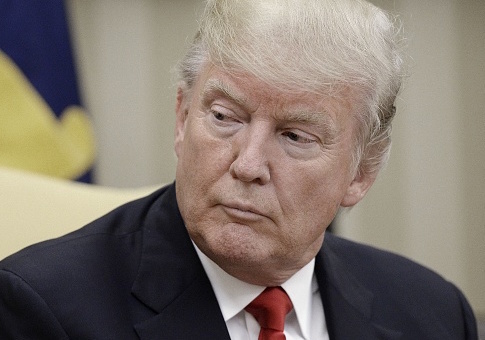 Upon signing the bill, which enjoyed wide bipartisan support in Congress and would have likely overridden a presidential veto, Trump expressed concerns that it contained "unconstitutional provisions" and "encroaches on presidential authority and may hurt U.S. ability to work with allies." Trump was partly concerned about a provision that prevents him from lifting Obama administration-era sanctions on Russia. "By limiting the executive's flexibility, this bill makes it harder for the United States to strike good deals for the American people, and will drive China, Russia, and North Korea much closer together," Trump added in a statement. The Russian government responded to the sanctions by ordering the U.S. embassy and missions in Russia to reduce diplomatic staff. Minutes before castigating Congress, Trump touted the state of the economy and the stock market, saying that businesses are thriving in the current environment. The Dow Jones Industrial Average on Wednesday morning hit an all-time high of 22,000 as the markets opened, a milestone that Trump appeared to attribute to his work in office thus far. "Business is looking better than ever with business enthusiasm at record levels. Stock Market at an all-time high. That doesn't just happen!" Trump tweeted on Thursday morning. Business is looking better than ever with business enthusiasm at record levels. Stock Market at an all-time high. That doesn't just happen! A few minutes later he sent out another tweet saying he plans to lift "costly and unnecessary regulations" to allow businesses to grow and create jobs for Americans, trying to fulfill a key post-election promise to get rid of regulations. "I am continuing to get rid of costly and unnecessary regulations," Trump tweeted. "Much work left to do but effect will be great! Businesses & jobs will grow." I am continuing to get rid of costly and unnecessary regulations. Much work left to do but effect will be great! Business & jobs will grow. Trump's series of tweets came as many political reporters and commentators continue to speculate whether new White House chief of staff John Kelly will be able to reign in Trump's frequent tweeting. This entry was posted in Politics and tagged Congress, Donald Trump, Health Care, John Kelly, Regulation, Russia, Stock Market, Twitter. Bookmark the permalink.